The second month of the New Year has begun, which means a fresh batch of content has hit the Google Play store. Among the most entertaining game genres offered to Android device users has to be the arcade releases. This time, we are going to introduce you to Salt Bae -The Meme Game that provides quick thrills and plenty of fun for the road. What is Salt Bae -The Meme Game? Salt Bae -The Meme Game is a game where you salt your meat like the stylish Turkish Butcher from Dubai who has gone viral from uploading his video of himself carving a steak and sprinkling salt over his forearm on to the meat. This game offers quite simple game play, the same as in the famous fruit ninja. 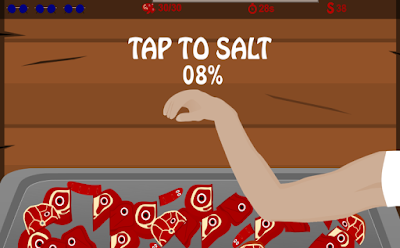 When you start the game, you see different pieces of meat coming out from the bottom of the screen now, by using your quick swiping skills you have to slash that meat pieces into two to make them ready for cooking initially there are 30 pieces of meat, which you have to slash in the given time. Once when you are completed with slashing these the next step comes up with salting them which requires your quick tapping skills, salt your meat as fast as you can and make it ready to prepare the finest steaks. The important thing that you should have to consider is that there are three lifelines, which you can see on the top of the screen. These lifelines reduce if you slash the blue colored glasses that appear on the screen along with the meat. There are three modes of gameplay, this app offers. The classic game mode is unlocked initially and for unlocking other two modes, you have to achieve the required objectives. The music is also cool enough and it has got easy to understand user interface. Direct download link to the game app is given at the end. It is free of cost and compatible with Android OS devices.